Welcome! 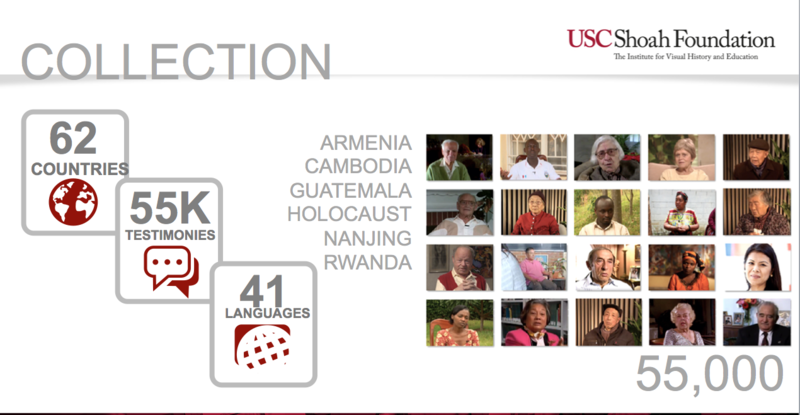 Find resources to explore and share the work of USC Shoah Foundation. 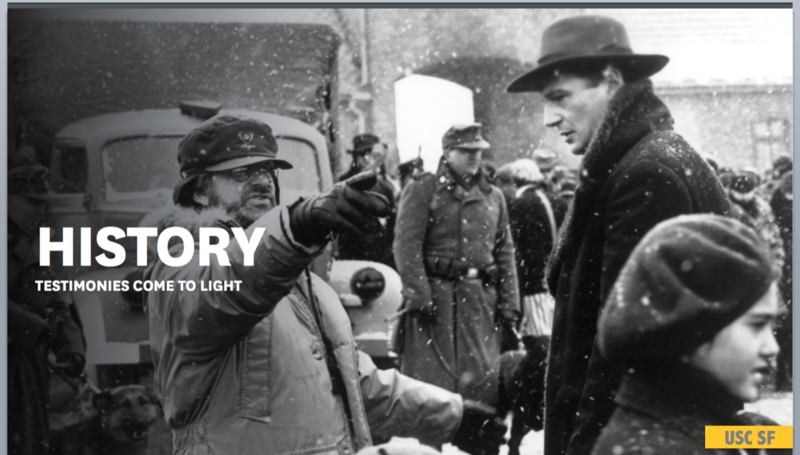 USC Shoah Foundation—The Institute for Visual History and Education is dedicated to developing empathy, understanding and respect through testimony. 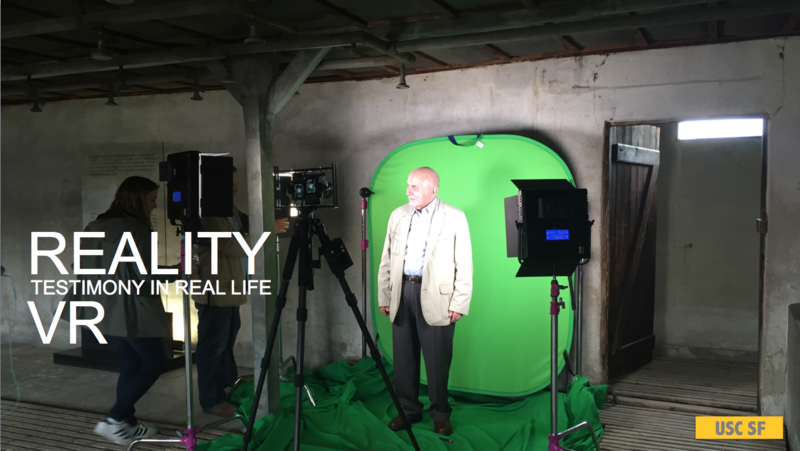 As keeper of the world’s largest archive of audiovisual testimonies of survivors and witnesses to genocide, we put storytelling at the heart of this mission. Our effort to expand on the collection of 55,000 testimonies continues apace, but our work extends well beyond amassing interviews. It would take 13 years of 24/7 viewing to watch the entire VHA. The VHA’s powerful search engine can key in on specific moments of interest. The full Archive is available at 85 subscribing universities and museums worldwide. Anyone with a smart phone or an internet connection can access the VHA Online, which includes 2,000 full testimonies and metadata and a slideshow for all 55,000 interviewees. The Institute’s no-cost, award-winning educational website that uses clips of testimony to teach the importance of tolerance and empathy. The Power of Propaganda: (Grades 7-9) Holocaust survivors talk about how their non-Jewish friends turned against them as German society was exposed to more and more anti-Jewish propaganda. The activity then asks students to create a PSA in IWitness aimed at their age group about how the media influences behavior. Refugees: Displacement and Resettlement: (Grades 8-10) Students learn the origin story of the UN Commission on Refugees, which was created to handle the flood of European refugees after World War II. They learn about the refugee situation in the present day, reflect on then and now, and pen a letter to somebody who has been resettled in their community. Witnessing Jim Crow: (University level) Students read about the Jim Crow laws that pervaded the American South. They watch clips of testimony from Holocaust survivors who relocated to Southern states after the war and were appalled to find segregation rules that reminded them of Nazi Germany. They reflect critically. 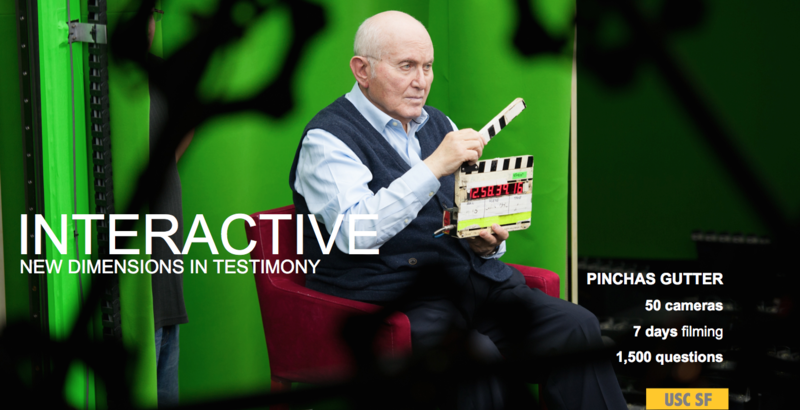 New Dimensions in Testimony is a collection of interactive biographies that enable people to have question-and-response sessions with pre-recorded video testimonies of Holocaust survivors. The technology is groundbreaking, but the aim is straightforward: Holocaust survivors are among the world’s best teachers of tolerance, and our time to have deep conversations with them is running out. New Dimensions in Testimony (a.k.a NDT) offers a way to preserve the ability to have these “conversations” long into the future. Interviewees include 15 Holocaust survivors and 1 Nanjing Massacre survivor. NDT’s machine-learning technology was developed to meet the goal of preserving our ability to interact with Holocaust survivors. NDT has been piloted at museums in NY, DC, Illinois, Houston, Toronto and more. The Center advances innovative interdisciplinary research on the Holocaust and other genocides. 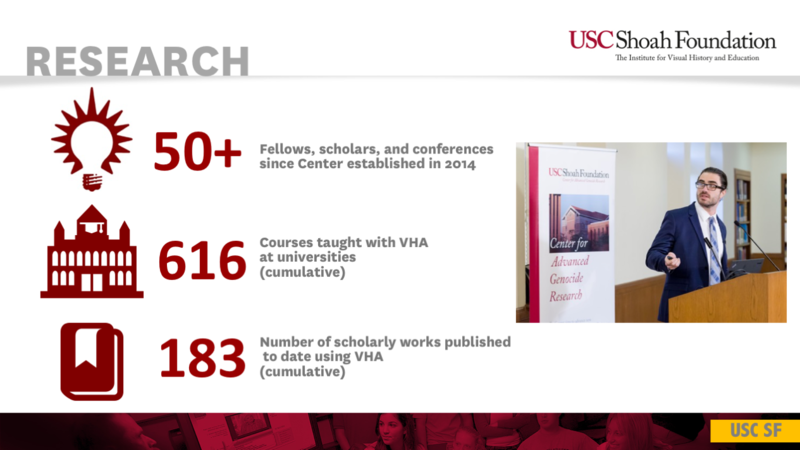 Each year the Center hosts dozens of research and teaching fellows, visiting scholars, and visiting researchers whose work is informed by the Institute’s resources. Directed by esteemed Holocaust scholar Wolf Gruner, the Center also organizes a yearly international conference on pioneering topics in genocide studies and hosts an annual lecture series. A historian who accessed testimonies in the Archive of survivors who’d been interned at a little-known Jewish ghetto in Nazi-occupied Poland. The interviews expanded her knowledge of the rare open-air ghetto, depicted in a series of photos she’d discovered. A doctoral student in fashion who mined the Archive’s collection of more than 700,000 photos for a thesis on wedding dresses. Renowned Holocaust scholar Omer Bartov of Brown University, who reviewed 250 testimonies to write his book "Anatomy of a Genocide"
In an instant, what started as a fun flag football game between two high schools turned into a crisis. During the end-of-game handshakes, one of the teammates from one school flashed a Nazi salute towards a group of students from the other. A commotion broke out – there was shouting and finger-pointing. Kids went home with hard feelings. Knowing they needed to address the situation head-on, the two schools organized a conflict-resolution session. 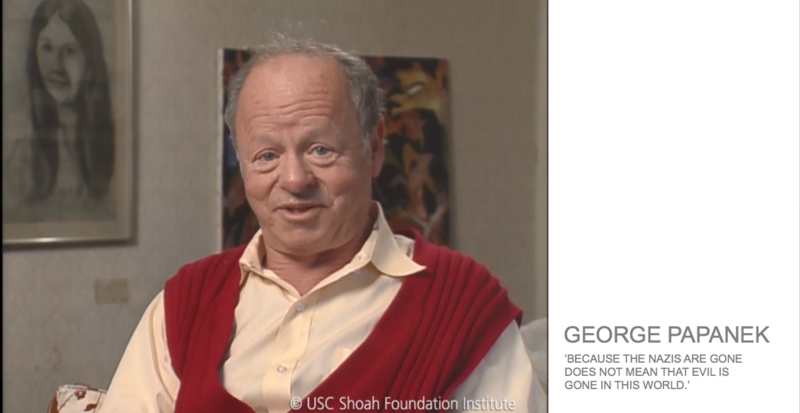 They brought in a member of USC Shoah Foundation’s education team. 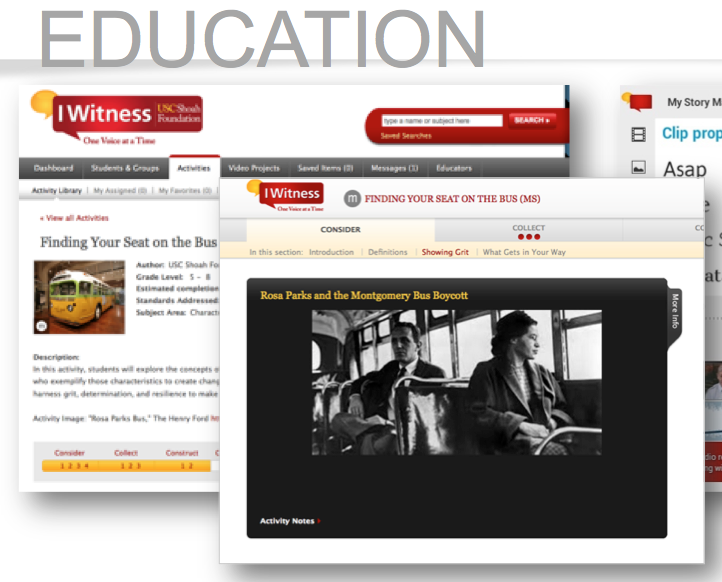 Our program staff introduced the two teams to activities in IWitness, the Institute’s online education program for K-university students. They watched clips of Holocaust testimony and testimonies about contemporary antisemitism. They also learned about what it means to be a bystander. The students viewed an infamous photo of a pro soccer player who was banned for life from international tournaments in 2013 for giving a Hitler salute after scoring a game-winning goal. Over pizza, the teammates got to know each other. They talked about their favorite TV shows and discussed similarities in their respective religions. One of the players drew parallels between his experience as a minority and the discrimination faced by many Jewish people. The gravity of the on-the-field gesture sunk in, especially for the offending student. By the end of the hour, students who’d been shouting at each other during the game were posting selfies on social media to demonstrate their learning that words matter, using USC Shoah Foundation’s #BeginsWithMe hashtag. A long-forgotten Nazi labor camp for Jews was lost to time. Or was it? Paolo Complojer knew he wasn’t crazy. Sixty-six years ago, he’d been among tens of thousands of prisoners who’d worked – under the watchful eye of armed Nazis – in a network of forced labor camps for Jews in what is now the Czech Republic. But now, in 2012, there was no trace of the gritty heating plant where he’d labored. Nazis had destroyed the documentation of the camp. Moreover, the city where the camp was located had literally disappeared – the Nazis’ aggressive coal mining had caused a massive landslide that buried buildings and left the town uninhabitable. Paolo made an appeal to a Czech high school teacher, who is a graduate of USC Shoah Foundation’s Teaching With Testimony program: Can you find the camp? The teacher put his class of high school students on the case. Using air maps, they located the camp and published an account on a website. Their piece was seen by a professor in New York who was writing several entries for an encyclopedia of camps and ghettos for the United States Holocaust Memorial Museum. The professor asked for more info. Once again, the high school teacher put his class on the case. Using the Visual History Archive, the class found 15 testimonies of Jewish survivors who describe the camp in detail. Thanks to the Visual History Archive, a long-forgotten labor camp was found. The polite way of saying it is that special-education teacher Andra Coulter’s small class of fifth- and sixth-grade boys had extreme behavioral and emotional difficulties. But the fact is, some could be downright mean – bullies, even. So when Coulter began her Holocaust unit, she wasn’t sure what to expect. As part of the unit, the teacher from Alberta, Canada signed up the class to participate in a Twitter chat with a Holocaust survivor named Paula Lebovics. Co-sponsored by USC Shoah Foundation and Discovery Education, the event enabled students around the world to ask Lebovics questions via Twitter and she would answer via teleconference from Los Angeles. Coulter’s students were astounded to be interacting with Paula, who they’d already studied in an iconic black-and-white photo depicting children standing behind the barbed wire at Auschwitz. Only now, the 11-year-old girl was an 81-year-old survivor. “My students could not believe that someone they ‘knew’ had survived and was speaking live that day,” Coulter wrote in a blog for USC Shoah Foundation. The boys later took Paula’s mantra – “silence is not an option” – to heart, so much so that they made it their class hashtag. Without prompting, they insisted on giving an impromptu speech at a school assembly about why Paula is important to them. “This group of five boys who up until then had often struggled in demonstrating empathy and kindness towards others, were now recognizing that their actions and more importantly, their voice, could have purpose in the world,” she said. Testimony forges friendship between young German Scholar and Holocaust survivor in California. As a 30-year-old woman in Germany, Olga Burkhardt knew she bore no responsibility for the Holocaust, yet she always felt that it was her duty to help heal the decades-old wounds it created. One night she came upon a testimony from USC Shoah Foundation that caught her attention. As she started to watch, something inside her began to stir. The woman on her computer was talking about her childhood and how, at the age of 6, she was taken away from her family. A few feet away, Olga’s own 6-year-old daughter was fast asleep in a home filled with love and security. Olga felt a connection to this woman she never met and hoped against hope that she would be able to reach out to her, to thank her for sharing her story. She contacted USC Shoah Foundation, and to her great surprise, the woman in the tape – Paula Lebovics – lives in Los Angeles and is well known to the Institute staff. Introductions were made and the two women began corresponding. A deep bond formed between the two and they quickly made plans to meet in person. Now, a few years later, they have been together several times and introduced each other to their families. They are so close, in fact, that Paula now refers to Olga as her granddaughter. Most of us know what gratitude feels like, but what does it look like in the brain? 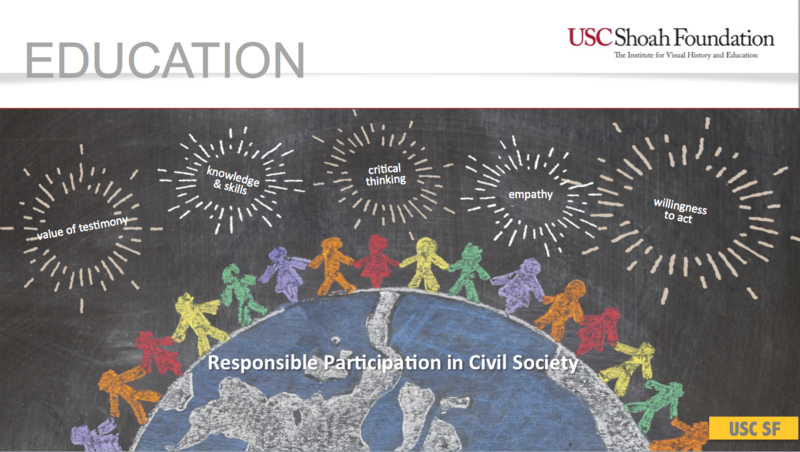 To find the answer, a team of researchers at USC made use of the Visual History Archive. 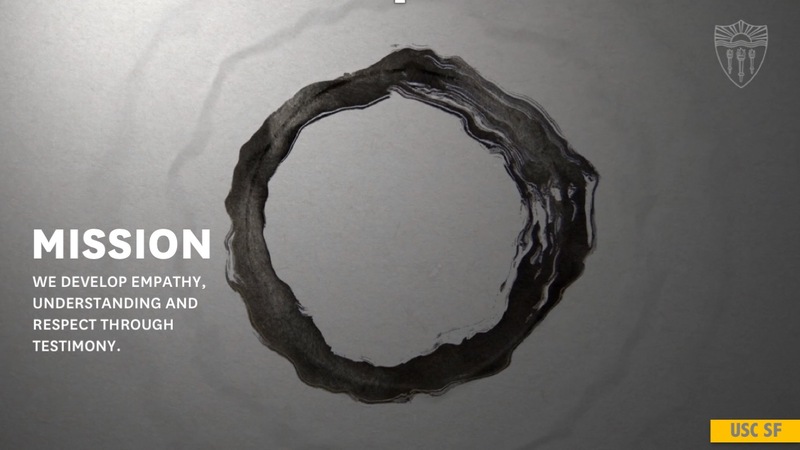 The results of the first-of-its-kind study were published in the prestigious academic journal Frontiers in Psychology. Here’s how the study worked. First, the researchers scoured the Archive for survivors telling stories about acts of kindness they experienced, such as receiving a piece of bread from a fellow prisoner, or finding refuge in a farmer’s home on a cold night. Participants read the resulting first-person vignettes under three scenarios: while wearing brain scanners, while wearing heart-rate monitors and with no physiological monitoring. Each time, the participants rated their level of gratitude. Rwandan and American students connected via Skype to talk about what they learned from the Bystander Effect activity in IWitness. In the activity, students develop an understanding of what it means to be a bystander and its potential impact in the context of the Genocide against the Tutsi in Rwanda. Students watch a number of testimonies from witnesses to and survivors of the Genocide against the Tutsi in Rwanda who describe the consequences of the bystander effect in their own lives. Students then construct a social media message that describes their own plan to counter bystander behavior. On the day of the Skype, the two teachers – trained by USC Shoah Foundation – posed questions to the group about students’ personal experiences and perspectives on the use of propaganda and bystanders in their own lives, and students took turns sitting in the “hot seat” and speaking to the class on the other side of the world. While the American students talked about the effect of media and propaganda in America today, the Rwandan students offered a dual perspective of both current events and also what happened during their country’s genocide a little over two decades ago. The activity and Skype chat were great successes in terms of delivering measurable outcomes: increased empathy and attitudinal shifts to counter hatred. “The activity left my students empowered to use their voice to fight injustice wherever it can be found whether it affects them directly or not,” the US teacher said.